Many new WordPress users worry that choosing to use a self-hosted WordPress website will cost them too much money when compared to the free wordpress.com version. I understand the concern. Reliable hosting sounds like an expensive thing. If you’re looking to start a new self-hosted WordPress site, you can find shared hosting plans that are more than powerful enough for your site for surprisingly little money. Don’t believe me? I’m going to prove it! 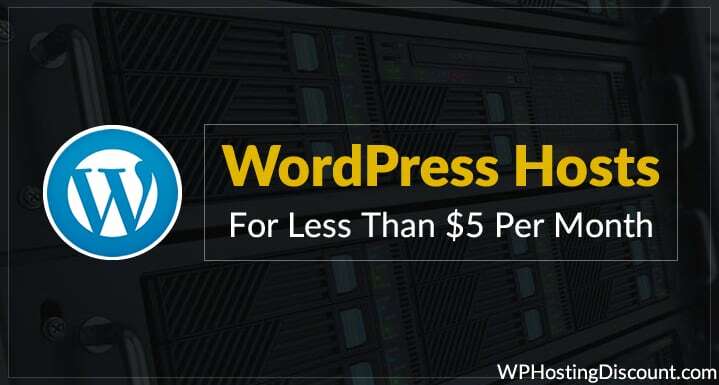 In this post, I’ll show you four quality, cheap WordPress hosting companies that will host your WordPress site for less than $5 per month. Yup, for less than a dine-in meal in many countries, you can host your site for a whole month. Bluehost offers optimized WordPress hosting at a very affordable price & it’s one of the cheapest hosting plans available when you buy their 36-month package. They’re an official recommended host from wordpress.org. 50 GB of storage (more than enough for most new sites). Make sure you use our Bluehost discount to ensure you pay less than $5 per month! Like Bluehost, SiteGround is another official wordpress.org recommended host. 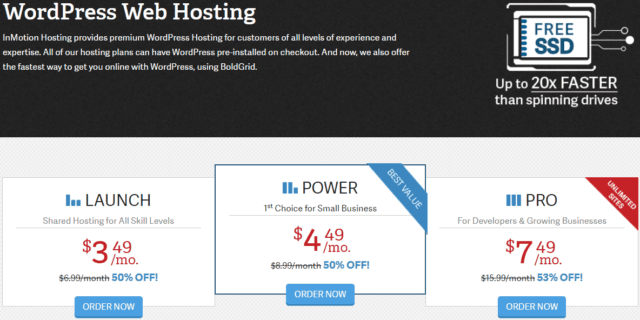 It offers managed WordPress hosting for less than $5 per month. None of the other hosts on this list can compete with that! That means SiteGround will handle things like updates, security, backups, and performance without you needing to lift a finger. SSD storage for better performance. Basic caching for faster page load speeds. Free SSL certificate and CloudFlare CDN. Make sure you use our SiteGround discount to get the best deal! While SiteGround is great for beginners, once your site starts getting lots of traffic, you may need to consider a SiteGround alternative. InMotion Hosting is the only host on this list who isn’t an official wordpress.org recommended host. But that doesn’t mean they’re not great. InMotion Hosting offers some unique features which make them perfect for beginners. First off, all of their plans come with their proprietary BoldGrid website builder system. This tool not only helps you install WordPress, but also configure it, and get your site looking exactly like you want it with a simple drag and drop builder. And like SiteGround, all of InMotion Hosting’s plans have free SSD storage, which means up to 200% better performance. Host 2-6 websites depending on your plan. InMotion Hosting currently offers two plans under the $5 per month limit. If you’re just hosting one or two websites, you can go with their $3.49 per month “Launch” plan. Otherwise, you can host up to six websites with their $4.49 per month “Power” plan. Which Cheap WordPress hosting Should You Pick? I feel confident in recommending any of the hosts above to new users looking to launch their site for the least amount of money. But there are some scenarios in which you might want to pick one host over another. For example, if you like the idea of having updates, backups, and security managed by your hosting company, then you should give SiteGround a try, as it’s the only budget host that offers those perks. And if neither of those things are very important to you, you can go with Bluehost depending on your preferences. I hope this post proved that you don’t have to spend a fortune to get good WordPress hosting. Now get out there and start your site! Let me know: Which host are you using to host your WordPress site? Share your experiences in the comments below. If you want to suggest any other reliable cheap WordPress hosting, let me know in the comment section below. 1.4 Which Cheap WordPress hosting Should You Pick? I think bluehost is better from rest of the others. I hear about bluehost all the time and heard that they have better support. Thanks for letting us know. It’s always good to know the latest that’s being offered out there, as the technology and volume of online traffic continues to expand and change…..